Are you aware it's pączki day? Are you Polish? If so, of course you are. If not, too bad for you, eh? Pączki are Polish pastries eaten on Fat Tuesday, or lent eve. When I was growing up my whole family would go to my Great Grandma Jenny's house in East Chicago, Indiana, for pączki day. She made giant platters of them that only the kids were allowed to dust with sugar. We would eat too many of them as a last hurrah before we couldn't have soda or gum or whatever we had given up for the next 40 days (when you got older it was all sweets). 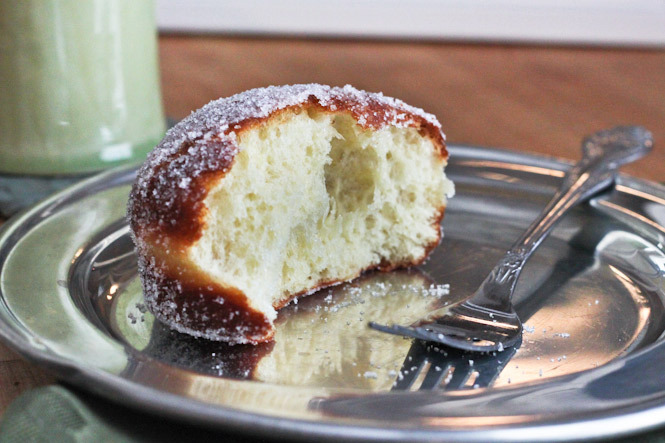 Nowadays a lot of bakeries would like you to believe that pączki are just classic yeast donuts without holes, probably so they can use their regular donut dough and call it a day. But Grandma's were different. Her pączki were a bit breadier and eggier, like a cross between a yeast donut and challah. We also did not eat them filled. Here in Chicago I have yet to find them unfilled (and some bakeries are getting a bit crazy with the fillings, like strawberry vodka or mocha), so I had to make them myself. Also, we pronounce them "poonch-key." Not "panch-key." These are best eaten the day you make them, so I make the dough the night before, cut them, and and let them proof in the refrigerator overnight. I also like them rolled in granulated sugar the best, but you can use powdered if you like. In a small pan, bring the two cups of milk to a boil. Remove from the heat and let cool to 115 degrees F.
In a stand mixer fitted with the paddle attachment, beat the stick of butter, 1/2 cup of sugar, and tablespoon of vanilla until just mixed. Slowly add the warm milk and mix until the sugar is completely dissolved. Scrape down the sides. Sprinkle the two packets of yeast over the mixture. Mix on low speed until the yeast has dissolved. Scrape down the sides and let stand for five minutes. With the mixer on medium-low speed, add the six eggs, one at a time, mixing completely after each addition. Add the 2 teaspoons of salt and scrape the sides again. Switch to the dough hook. With the mixer on low, sprinkle the flour over the mixture, one cup at a time. Keep adding the flour and mixing until you have a fairly smooth, sticky dough. It will be very soft and elastic. You may not need all of the flour; I used 7-1/4 cups. You don't want to overwork the dough; I use a spatula at the end to get the last bits of flour mixed in. Spray a large bowl with nonstick spray. Transfer the dough to the bowl and turn once to coat. Cover with plastic wrap and let stand until doubled in size, about 1 to 1-1/2 hours. Once the dough has doubled, prepare cookie sheets with parchment/silicone baking mats and nonstick spray. Set aside. Lightly dust your rolling surface and rolling pin with flour. Working with half the dough at a time, roll the dough to about 3/4-inch thick, keeping the board and dough lightly floured at all times. Use a 3-inch round pastry cutter (or a drinking glass) to cut out circles of dough. Transfer to the prepared cookie sheets. Continue cutting the dough, rerolling as necessary, until both halves have been used. Wrap the cookie sheets in plastic wrap. At this point you can put them in the refrigerator overnight or let them rise again for about an hour before moving on the next step. If you refrigerate them overnight, let them come to room temperature for about an hour before frying. Line a cookie sheet with paper towels. Fill a shallow dish with the sugar of your choice for coating. Set aside. Pour about two inches of your favorite frying oil in a large, heavy pot and bring to 350 degrees F over medium heat. Fry four to six pączki at a time, flipping when they are a golden brown (about 2-3 minutes per side). Check the temperature of the oil occasionally. When the pączki are ready, transfer to the cookie sheet lined with paper towels. Let them cool for about 2-3 minutes before rolling in the sugar.